I think splurging on a nice dress for your daughter's wedding is perfectly okay. Repurpose it if need be. ~I found Blood Oranges on sale for $1.49 a pound, which is cheap. I wanted to make marmalade for my husband, this is the only kind he likes. Whether I wasted money or not depends on whether I can save the marmalade and fix it from being too thick. Honey requested that more sugar be added, now it is very thick and gooey. ~I took some of the peels and ends and placed them in a quart size canning jar and then added white vinegar. Once it has steeped, I will strain it and use it for cleaning. ~I took the lemon that was zested and juiced for the marmalade and cut it into quarters to freshen the disposal. I have 3 pieces in the freezer for future use. ~After doing a swap with Beverly from India a few years ago, I discovered candy coated fennel seeds. These are great to freshen your breath with. I placed some in a small Altoids mini tin and keep it in my purse. One or two go along way. ~I made some Breath Freshener/Mouthwash using distilled water, vegetable glycerin and peppermint essential oil. I store it in a Tom's of Maine mouthwash bottle. It is so refreshing. ~I had a Geranium plant that was getting leggy. I clipped the leggy portion and placed in a mason jar with some water to root. My girlfriend wanted to recover her chair. She did buy some heavier denim. She has worked on this chair for a couple of months. Yesterday I was at her house and the creativity to save money was so impressive. She cut up jeans that had the felted seams that run down the leg of the pants and used that as the trim to hide seams on the chair. It was so well done and genius. It looked like she had purchased it at an upper end furniture store. She is the queen of utilizing and repurposing everything. I am honored to be her friend. She teaches me sooooo much. Been away with some health problems since late fall but checked in to learn from all the clever ways to save. Received a free turkey at Christmas from spending so much money so made stock with lots of meat in it. Pressure canning all that goodness tomorrow. Saved the beast to slice & freeze for sandwich during outside spring work. Found orchids that were totally had & trying to bring them back. They all have a new leaf starting but the original leaves are still kind of limp but they're nice green colour so we'll see. Any orchid experts? Starting violets for gifts later in the year. I keep my eyes open for free quirky little pots. Finished a scrap rag quilt & boy this one was REALLY scraps! Some squares are pieced together but I used up most of my flannel stash. YIPPEE! Any chance of a pic of the denim chair.....neat idea! I was wondering if you were alright. I still need to be brave and use my pressure canner. It seems like whenever I plan on it, something comes up that will not allow me the time to do it. ~Trimmed an Ivy that I have in hopes of rooting it. Sharon - Honest, it's super duper easy. I was super nervous about using my pressure canner, too, but now I'm sort of addicted to it! After a couple of times, it doesn't seem so scary, believe me. I do, however, still pull out the book and follow the directions to a "T." Better safe than sorry, after all! Did you get my email the other day? Hope everything's okay! THANK YOU!!!!! LOVE YOU!!!! Last week I found a really good deal on corned beef. (I am still planning to get my brisket from the butcher this weekend for St. Patrick's Day, though!) I ended up canning nine 1 1/2 pint jars of corned beef. I'm so excited! Whenever we have a boiled dinner, there are never enough leftovers. Now we'll have cooked corned beef at the ready for corned beef hash and Reubens! I'd really like my next venture to be canning meatballs and meatloaf, but there are conflicting reports out there about what you can use in your meatloaf (no eggs, bread crumbs, crackers or anything like that). I need a good recipe and am working on my plan. There is a recipe on CanningUSA.com, so I may give that a whirl first. The only thing is, they do not pre-cook the meatloaf in any way, which leaves room for lots of fat to build up in the jar - ew. Not liking that at all. I've read you can par-cook the meatloaf before jarring it, which will drain a lot of the fat away, and then add tomato sauce or juice to the meat before canning. That sounds much better to me. I've also read that it's better to make meatloaf patties and layer them in the jar before canning. SO many different ideas... And what is so surprising to me is that in many of the canning videos I've seen, people are still using eggs and crackers and/or bread crumbs! Then again, they are doing the same with meatballs... I don't know what is right!? Have any of you ever done this? I just want to can it to have ready-made meals for the guys to pluck from the shelves when I'm not here to cook. I do freeze meatloaf and meatballs, but I have very limited freezer space. Plus, if it's a matter of opening the freezer or picking up the phone to order pizza, they're going to order pizza. Ugh. If there are meatballs on the shelves, all they have to do is heat them up in some sauce, throw them on a bun with some cheese and they've got an instant hoagie that I know they'll love! So, if any of you have canned meatloaf or meatballs, I sure could use some advice. Oh! And someone likened the smell of canned meatloaf to dog food - eghads! If THAT's what it's like, I'm not going to make it at all! Any input??? I also recently found - and fell in love with - Nellie's All-Natural Laundry Soda and Dryer Balls. Oh my word! This stuff is the BEST. I only use a tablespoon of the powder in my wash, and it does a fabulous job cleaning everything! Nellie's is all-natural, non-toxic, hypoallergenic, AND environmentally friendly. And the best part? It doesn't irritate my skin - AT ALL!!! Our clothes smell fresh - even my husband's really nasty, dirty work clothes! And they are not at all perfume-y like they are with store bought detergents! I can even use it on my "delicates" without concern! The best thing is that even thought I use cold water, our clothes STILL come out super clean! And believe it or not, somehow, they seem even softer - almost fluffier! It's amazing! I really was hesitant to try, but I'm so glad I did! The deal I bought is costing me only about 11 cents per load, but after a little investigation, I've found it would probably cost even less - only about 8 cents per load - if I bought it in bulk online! I know I could make my own laundry soap, of course, but I've read so many mixed reviews as to how well it really cleans your clothing, and I really don't like the residue it can leave behind. The Nellie's WORKS, so I'm going to stick with it for a while! Up until now, I had been using All Free and Clear. My foster daughter had introduced me to it a few years ago because my skin was becoming increasingly sensitive to all sorts of products. They had been using the All Free and Clear with tremendous success, so I decided to give it a try myself. In all fairness, it was pretty good, too; but my skin would still get red and itchy, especially in bed at night. Nellie's doesn't cause me any discomfort at all! I'm not sure if it's because it rinses away so well, or what, but there is SUCH a difference - it's amazing! And you know what? With the All Free and Clear, I still had to run a second cold rinse in order to get all the soap out of my clothes. I don't have to do that with the Nellie's - our clothes are fresh, clean and residue-free after just one rinse! It's SAVING me money!!! I decided to crunch the numbers, just to see how much more it was costing me per load... I figured somehow it HAD to be more expensive than the All Free and Clear! At the grocery store, even on sale with a doubled coupon, the All Free and Clear cost almost $.10 per load more (no real shocker there, though, considering grocery store mark-up)! At Costco, however, the 110 load All Free and Clear was only a few cents more per load than Nellie's. I decided that with the savings on water usage, with how clean our clothes are now, and due to how well my skin is responding to it, I'm making the right decision to use Nellie's from now on! Having said all of that, however, I will also share that I have read reviews saying that Nellie's does not work very well with hard water. I can't help but wonder, however, whether that is more a problem with the Nellie's Nuggets, rather than the Washing Soda powder I have tried. If you have hard water, you may just want to try a small bag first to see how well it works for you. Okay... now on to the DRYER BALLS! Oh my WORD! I was really skeptical about using them, too, but I've used them for a couple of weeks now, and am finding that they are cutting my dryer time anywhere from 30 - 50%, depending upon how heavy the load! My dryer balls did come with the scent sticks, but I have only used one once. I don't feel they are necessary. We love how clean and fresh-smelling the clothes come out straight from the washer. I don't want my clothes competing with any other fragrance we may be using on our person! I even tried the dryer balls on the "air" cycle with my dresses, which I always hang dry. In the winter, they take a lot longer to dry inside the house on a rack than they do when the weather warms up and they're drying on the line. You'd be amazed the difference the dryer balls make even when only running clothes on the air cycle! Thanks for the encouragement! Just when I want to try canning with it, it seems like something comes up. Soon, Lord willing! ~We found a source for cow shares and fresh eggs. The milk that we get is cheaper than Horizon brand and way better being raw. It is so much easier on our tummies. The eggs are the same price if not cheaper than Eggland's Best or comparable brands. ~A friend gave me about 2 dozen canning jars so I am excited about that. Now to find a good source for lids in bulk. I remember seeing a vendor on e-bay so I will check them out. ~I started rooting an Ivy plant that I have, the Geranium has roots! A neighbor approached Michael and I regarding helping them with their very large garden. They have a contract with the school and other businesses and would either pay us cash or produce. We want to talk with them more about it and maybe give it a try (see if we can physically do it). If so it would be great to get paid with produce so I can stock up the freezer and pantry. The grade school at which I volunteer has snacks everyday. The ones that aren't handed out during the day are given out as afternoon snacks. On one occasion there were three boxes of mixed carrots and snaps peas which would have to be thrown out. I volunteered to take one box. I unpacked them from the plastic bags and ended up with two large bowls of carrots and snap peas. After a few days of snaking on them and giving them to the dog for treats, I realized that I had to preserve them in some way. I steamed them, put them into zip lock bags and put them into the freezer along with the Brussels sprouts I steamed last summer. Nini, thanks for the advice! It's amazing when you really stop to break down the cost of items you use. Smaarrrrrt lady! Sharon, NICE looking pigs! Have had a few sows before but now we get wieners to finish off. Great save on the vet bill! 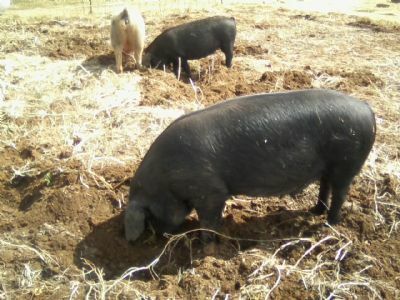 We've used pigs to break up whole pastures....worked beautifully! Don't be worried about the garden work! Now saying that there's days that I'd give the WHOLE farm to the next passing person (couldn't be another farmer since he might be in the same boat on the same day! LOL) but we have 3 VERY large gardens & it's so worth it! We sell produce, eggs, meat, baking/etc farm gate style & will go to markets this spring with asparagus which is finally ready. ps....please show your piglets when they come! I really miss the little ones! It's hard to believe how gentle those huge sows are with the babies! Can really see your taco meat being handy! I'm trying hard to get pressure canned food put up this year since I use them as more long term storage. I mean I use the frozen items first in the winter months then those jars. How do you ladies use pressure canned items in your rotation of food? I do need help on pressure canning, if someone can help??????? I canned the turkey stock & 3 jars didn't seal proper. They were in 2 different batches. I've phoned the canner maker & didn't really get a answer. It sounds like it could be a dozen things that went wrong with the jars. Has anyone had this happen???? I opened the stock & froze it. It broke my heart after all that time to just freeze it. Marie, nice find! I use my mixed bags for Chinese food night. Have sprouts in the window just about ready for sandwiches! Yummy! We grow lettuce boxes inside for fresh greens through the winter. Sewing some BD gifts up. Eggs, & baking were picked up this morning. Always good to have it gone for the weekend. Sharon - your piggies are so cute! They look so happy and healthy!!! Love them! Great score with the cow and eggs! Lucky you! And that is SO cool about the neighbor's garden! I'd be hopping right on that, myself! :) Awesome! How did you root your geraniums!? I love geraniums and have been looking for seeds, but I'd probably do better rooting them, anyway! Sheila - Thank you SO much! You have been extremely helpful! Do you dry can your meatballs or can them in sauce? I am planning to do ground beef next, and wasn't sure whether to can it in water or dry can - I think I'm going to dry can it because, to me, it looks the closest to browned ground beef fresh from the pan. I wasn't sure whether or not to season the meat, but I think I'm going to definitely try the taco meat - thanks so much for sharing that! I would like to have ground meat prepared and at the ready for things like spaghetti sauce, shepherd's pie, chili, taco meat - you name it. It truly doesn't take a long time to brown ground meat when you're cooking, but I have more storage space available on shelves than I do in the freezer. It's important to me that I am able to take advantage of the really good sales when they come (our butcher - can't say enough good about him! ), so canning the meat is making such a difference in our budget. We slowly built up our pantry over the past year or so, and now we're in a good place to purchase sale items in bulk. I want to take full advantage! - Dehydrated 10 lbs. of mushrooms into 2 quart jars and vacuum-sealed them. - Reserved the mushroom stems and will be chopping them up to make cream of mushroom soup. (YUM - there's nothing like homemade!) If I'm able to make enough soup, I think I may try canning it, too! - Cabbage has gone on sale at an even BETTER price this week, so I'll be heading back to the store and dehydrating a whole bunch of it. Can't wait! We love cabbage! I also have quite a bit in the fridge right now, waiting to become sauerkraut. There just hasn't been enough time in each day! I think if I can head out to the store tonight, I will process all of the cabbage all at once tomorrow night - wish me luck! - Cooked up my last squash and HUGE pumpkin yesterday. I made a pie with the squash - yummy! I let the pumpkin sit overnight in the fridge so it will separate from the liquid. I'll be dehydrating it tonight and turning it to powder tomorrow. :) Yay! Girls - just wondering... What's the best price you've found on sugar, and where? Ok, I'm all charged on doing pressure canned meats! I've done tomato based stuff, stock/etc but never the meat side of things. I'm certainly coming to your house for corn beef!!!!!!! Yummy treat!!!!! Nini, will do the vinegar wipe from now on! I'm super careful with canning any which way but I missed something this time. Never use OLD recipes...to scared to! I can't see that the stock with turkey meat in it would be bad since I froze it right away. What do you think?? One thing....what is dry canning? Never heard of it but sometimes things are worded a bit different between our areas but mean the same. Just wondering???? OK.......I have to get this clear in my head........ ...bake off meat balls with NOTHING but meat then fill jars & add water or ????????? Would really like to try since a whole beef is coming our way soon. A while ago saw your pumpkin.....yummy! I finished off our French ones making soup. Made lots of pumpkin soup before but never with this type of pumpkin & it sure made a difference! That's a "DO AGAIN"! The seeds were sooooo yummy roasted! Have to ask what you use the pumpkin powder in? Taste...thicken????? Finished off bread & baking orders & those went out the door this morning. Yippee!!! Made orange choc almonds with Valentine choc. Had the choc frozen since the sale. Chased calves, chopped wood & then had a GREAT tea break! Oh, has anyone pressured canned chickens before????? I've read that NO bones????? Anyone know how to????? I would think your stock with turkey meat will be fine in the freezer... You did this pretty much right away when you realized the jars weren't going to seal, right? I am pretty sure that you could even have re-processed it in the pressure canner, too, as long as you started completely from scratch (re-boiling the food, using fresh, clean jars and brand new seals, etc.)... I am no expert, but I'm learning, and that is what I've read. I have also canned my raw chicken breast pieces and the raw corned beef without adding any additional water - I put the raw meat pieces directly into the jar leaving a one-inch headspace and then pressure canned without adding any juices... The meat makes its own broth. I did add a bouillon cube to the chicken, and I did sprinkle a little bit of the seasonings in the packets that came in the corned beef package on the corned beef before processing, but other than that, I just packed the meat well, removed pockets of air as much as possible with the little doohickey you use to remove air bubbles in wet-canned foods, and the meat did the rest while processing in the pressure canner! The broth fills any air space that might remain between the pieces of meat while cooking. Actually, the meat seems to kind of tighten up and stick together, and then the whole thing is sort of floating in the juices. It's amazing. The meat turns out very tender and so, so yummy! I have never had meat come out uncovered with broth, but from what I understand, even if it's not fully covered, the meat is fine. The pressure canning process removes the air, and that means no spoilage. Pretty nifty, I think! And seasonings are not required - it's just a matter of personal preference!!! Apparently, a lot of people can their meatloaf this way - no pre-cooking but rather raw-packed tight, with no additional liquid or sauce. But the question then arises whether the meat is too dense to heat up to the proper temperature for canning. A lot of people still do it this way (using the ground crackers, bread crumbs AND eggs, I might add! ), but I was worried about that. I saw a few people mention (including Jackie Clay from Backwoods Home) that they make meatloaf patties first, slightly brown them in the oven (to drain some of the fat), layer them in their jars and then can them in tomato juice or sauce. To me, that looks a lot safer. But I'm all about saving time, if it's within safety guidelines, too. CanningUSA suggests a recipe that doesn't use eggs or cracker or bread crumbs, and uses the raw pack method, but uses pint jars, I'm assuming so that the meat is not uber dense while processing. I didn't find a recipe for it at all in the Ball Canning Book. It's a bit daunting to try to maneuver your way through the recommendations, that's for sure! I have never pressure canned chicken parts before, but I'm pretty sure you can can it with the bones... Here is a link to Jackie Clay's recommendations for canning meat: http://www.backwoodshome.com/articles2/clay105.html If you scroll down to the section about "Home Canning Poultry," she discusses her preferences to raw packing vs. hot packing her chicken. In the sixth paragraph, she does talk about how to process bone-in meat. In the seventh, she discusses how she prefers not to can with bones in the meat, but instead uses the bones to make broth. I haven't ever canned anything with the bone-in because I like to use the bones to make soup, and then I can that. I haven't ever canned a whole bird, though. I buy breasts in bulk, and can those using raw-pack method without any additional liquid (I've found pints are better than quarts - for some reason, the chicken in quart jars seems more grainy or dry; but using pints it's much more tender. Probably has something to do with the processing times.). Any other chicken or turkey meat I've canned is usually leftovers from a sizeable bird after a good meal. I make stock using the bones, then chop up any leftover meat and can both together. When I'm serving the soup, I'll add some dehydrated mixed vegetables and dry noodles to the soup in the pan, and then serve it when done! YUM! What are orange chocolate almonds!?! OH MY! That sounds HEAVENLY!!! Nini, I do can chicken parts with bone in raw -- sooooo easy :) We raise meat birds and when we process them I like to freeze the boneless breasts and then can the thighs/drumsticks raw. It's so quick and easy to just pack them into the jars and put lids on and seal. I like this way because it's so fast and also the spaces fill up with liquid/stock (gel-like, you know what I mean) -- it is a little more difficult when it's time to use b/c you have to separate the meat from the cartilege and bones, but it's tasty and soft and you have that really good-for-you stock. When you have 30+ birds to process the speed of canning the legs this way is great. Gosh, Thanks soooo much Nini & Sheila for sharing your wisdom. Like I said the pressure canning meat thing is new to me but would be soooo handy! Will keep learning & try everything! Went into the city & stopped by some stores we usually don't have time for & found great quality NEW night gowns at a women's dress shop. They just wanted to get them out the door since they were from Christmas....so the owner gave me them for $1 each. Certainly can't buy the buttons for that! -99 cent sweater sale....found colours for felting..yippee. -traded bedding out plants for a small quilt hanging today. We were both happy campers! Sharon, I made dryer balls and just love them. They are really easy to make! Start with 100% wool yarn make sure it is not superwash just plain ole wool yarn. I used left overs from some fleting projects I had done. Rool the yarn into balls. Take a yarn needle and run the end of the yarn through the ball to secure it. I made them about the size of tennis balls. Once the balls are the size you want them and the ends are secure soak the balls in hot water untill they are wet all the wat through. Put the wet balls in the dryer with your next load. The wool will felt and the balls will be done. Then you can just leave them in the dryer. Thank you, Sheila, for the insight about canning the chicken with the bone in! That's awesome! I will definitely have to try that! I am wondering... when you can the chicken in broth, does it still come out easily-shreddable (for lack of a better description), or does it hold its shape/texture better? The reason I ask is that I'd like to can some larger pieces that can be served individually rather than having the meat shred up so easily. It's not a big deal, but I wondered if maybe canning it in water or broth will make the meat turn out differently so I can use it differently in recipes, you know? Thanks so much! Judy! Those sound so yummy! What an excellent idea! Maybe I'll try making them with the kids for Easter! Thanks for the idea!! :) And what a DEAL on those nightgowns! Good for you! That's awesome!!! I think I've decided that I am NOT a big fan of canned pepperoni... It's just "different." It works okay in my recipes, but no... just don't like it. I honestly don't think I'll do it again unless I find a better way of doing it! Have any of you had experience with this? I ended up dehydrating six big heads of cabbage down into three quart jars... And let me tell you, it's DEE-LICOUS! I think I could eat it right out of the jar as a snack! I also started 7 1/2 pounds of sauerkraut. I can't wait. It's already fermenting and smelling just wonderful! I think when this is done I might give fermenting pickles a whirl! I got a really good deal on onions, carrots and celery this week, too. Since we were running low, I bought 10 lbs. yellow onions, 3 lbs. red onions, 5 lbs. carrots and 3 lbs. celery. I coarsely chopped most of the yellow onions and dehydrated them into three pint jars. Then I sliced the rest of the yellow and all but one of the red and dehydrated those as a mix down into four pint jars. The carrots were amazing - I diced them up and all five pounds dehydrated down to not even filling a pint jar! And I chopped all the celery, including the leaves, and it all dehydrated down to a pint jar, too. I'm telling you, it all smells so fragrant and is so tasty! Next time, I think I might shred the carrots for casseroles and baking. I'm just going to wait for the right sale! Has anyone canned bacon before? We have quite a bit in the freezer from when we bought our half pigs, and I am seriously considering canning it to make room because we really don't eat a lot of it. Easter is coming and this is the only time of year I can purchase lamb from the butcher, so I really need the freezer space. I hesitate to can the bacon because the pepperoni didn't go so well, but everything I've read makes it sound like canning the bacon would be a great option. I'd sure feel better if you all would share your experiences! Hay there Mz Nini, Glad you are feeling better. I just have to ask you about all the dehydrating you are doing. What recipes will you use these in? When you say they fill the jars does this mean you just pour it in and put a top on it or is there a processing that has to be done. I have a dehydrator but I have only used it for jerky. Hey - did you ever get my email about writing something for you for the turkeys??? If you need me to do it - I'm happy to!!! The dehydrated veggies... Yes... After dehydrating them, I put them in a dry, sanitized jar, then vacuum-seal them. I don't think it's necessary to vacuum-seal anything unless you are planning to have it in long-term storage, though. Since there is only three of us, we don't go through a lot in a short amount of time. I find it's much better to divide a big batch - like the onions - into smaller jars and then vacuum-store them. One small pint jar will last us a good while, so I know the others are stored well and waiting for us when we finally finish the first jar. :) That is just my preference, though. I use my dehydrated vegetables right in my recipes - whatever I'm cooking. Since the veggies lose anywhere from 85 - 95 % water, I only need to use a very small amount for each meal. For example, I know that the carrots (according to Mary Bell's book) lose about 88% water, so if I need a cup of carrots in my recipe, I just figure I only need to use about 1/10 of a cup of the dehydrated carrots. (That's .12 rounded down... Carrots shrink down to 12 percent of their normal size - 100% less 88% water leaves 12% product) - it's only like a couple of heaping tablespoons, I think... I just eyeball it. If the recipe has liquid, I don't need to add more water to it - the carrots would rehydrate while cooking. If I want an entire side dish of dehydrated veggies, I just add about 1/2 cup or so to a pan and boil in water until cooked. I could rehydrate onions, but usually just toss some right into whatever I'm cooking. But if I wanted to rehydrate them, I would just have to soak them in hot water for a little while. That's what I plan to do with the slices - rehydrate them along with some peppers, then caramelize them a bit in a pan and use them on sandwiches or with pierogies or something like that. Next time I get a good deal on carrots, I'm going to shred them instead for casseroles and carrot cake (did this with zucchini and it worked wonderfully!). I recently found a post online where the family dehydrates whole baby carrots! It took a long while for them to dehydrate, but when they were done, they were like small matchsticks! The lady just rehydrated them in a bowl with a little water overnight in the fridge - it looked just like the stuff they had purchased right out of the bag! Amazing! There are some things that I've dehydrated that we really don't like - eggplant is the first that comes to mind. Not sure if I rehydrated it properly or not, but it turned out very rubbery and chewy. We probably won't do that again any time soon. Next time I find a good deal on lemons, I'm planning to dehydrate them, too. I will rehydrate them for use in dishes (for example, atop baked fish or chicken), or I will plop them dry right into a glass of cold water for a refreshing flavored water this summer (I can get many glasses out of just a couple of lemon slices - just keep adding water and ice!). I also have a whole bunch of canned pineapple in my cupboard right now. At some point, I'm going to need the space, so I plan to eventually dehydrate the pineapple as well. And I heard recently that canned fruit cocktail dehydrates into a delicious fruit candy - that would be such a nice alternative to the real candy at the holidays! We'll definitely have to try that... I just won't use the syrupy stuff! You'd be shocked at how little in rehydrated veggies you'll need for recipes or side dishes! That's the beauty of dehydrating, as you know - taking out all the moisture leaves a very small amount behind for storage! A pint or quart of dehydrated veggies will go a loooong way! And what I really love is that you lose very, very few nutrients when you dehydrate veggies and fruits as compared to what you lose when freezing or canning! Seriously - give it a try! I have never made jerky, but I'd like to try sometime. My son loves the stuff his friend's parents make during hunting season! We don't hunt, so it's never been a priority. Is it easy? How do you make yours? Can I use meat from the butcher? I read that you can dehydrate canned meats, too - tuna, for example. It's supposedly excellent for backpacking. I just don't foresee myself doing that. I imagine that since dehydration enhances the flavor of foods, tuna would be very - gulp - gnarly-fishy??? Let's just say, if we're taking a hike down one of the local nature trails, I'll just make my tuna salad in advance and keep it in the cooler in the van until we're ready to make sandwiches! LOL! Hi Jamie! OH! I have missed you!!!! So good to see you!!! I'm hoping and praying you and all your loved ones are okay and far, far away from that landslide... SO heartbreaking! I have something else SO exciting to report! Every other month we receive an estimated electric bill. Since August, we have seen a steady decline in our charges. Last month's estimate was slightly over $90, which actually wasn't too, too bad for us (although I hate paying that much for electricity!). THIS month, however, our ACTUAL bill came in at just under $65!!!! Averaging both, that means we're using about $78 in electricity monthly! That still seems like a lot, but since our usage last year was about $25 more per month than now... And the year before THAT we were spending a good $50 more a month! Is that amazing or what?! I sincerely believe all the little changes we have made have added up; however, the biggest change has been dropping the cable and not having a cable box plugged in round the clock (they're NOTORIOUS energy drainers). I honestly believe that has reduced our bill significantly. We did also switch over to a gas range a couple of years ago from electric, but I don't recall seeing a huge change in our monthly bill - our electric didn't go down much, and our gas hardly increased at all. Other changes included hanging a lot more clothing to dry - both indoors and out; we dropped our home phone line (no more portable phones plugged in 24/7), our son's video game console is unplugged whenever not in use; we run the heat a lot lower now that we did a few years ago in the winter (took some adjusting, believe me - my throw blanket and I have become wonderfully close friends! ); and we are very careful not to leave lights on. And, OF COURSE, we have incorporated so many less obvious, wonderful energy-saving ideas from MaryJane and our farmgirls over these past few years - THANK YOU, EVERYONE!!! I'm sure - SURE - there is more we can do, and I WILL find those energy suckers and eradicate them; but for now, I'm just thrilled with what we have accomplished thus far. Amazing. Simply Amazing!!! Jami, When I have extra onion, peppers, etc left that I know I will not use right away I chop them up, lay them out on a cookie sheet. Put in freezer to frozen. I then put in ziplocks and back to the freezer. This way they don't stick together or freeze in a clump. I use these veggies for quiches a lot. I also recently made a mock angel food cake that took 16 egg whites. Glad we have our own eggs. That left me with 16 egg yolks. I froze the egg yolks in containers that held 3 or 4 each. I am going to use them gradually when making scrambled eggs. I have never done this before, but read I could freeze them. We will see. By the way, hubby loved the cake, said it was much better than purchased angel food cake. Personally, it was a lot of work for cake, but I love the experience of making something new.